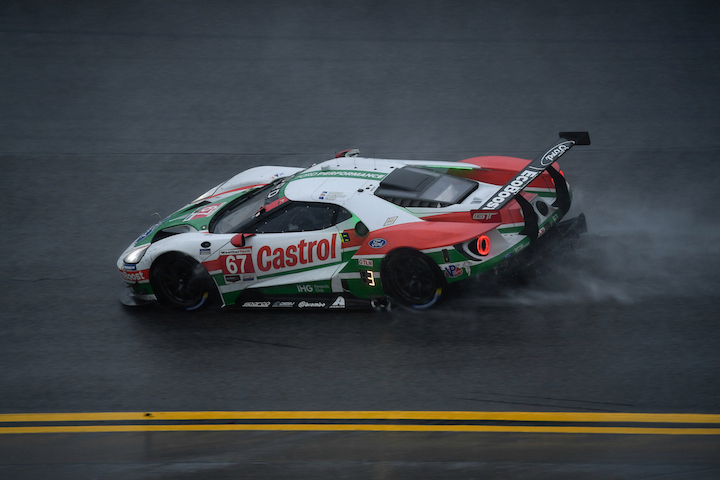 A Ford DPi program isn’t out of the question, the automaker has confirmed, but it first wants IMSA to commit to mandating hybrid cars in its top class from 2022 onward. Ford motorsports director Mark Rushbrook recently sat down for an interview with Sportscar365 to discuss the future of the brand in the IMSA WeatherTech Sportscar Championship. The Ford GT program is likely set to end after 2019, but the automaker could extend the program if it decides to enter the top-tier DPi/prototype class later than 2020, he explained. “Whatever happens with GT and DPi, they need to work together and bridging into each other,” Rushbrook said. IMSA is currently evaluating a reset of the DPi/Prototype class rules for 2022. Ford wants there to be relevant technology transfer between the DPi/prototype car and its road cars, though, and will only commit to a program if it’s satisfied with the 2022 rules. A spec hybrid system is believed to be among the possibilities for the 2022 rulebook. This would satisfy Ford’s desires, Rushbrook said, so long as it was free to develop and tune aspects of it, such as the software that controls it. “There’s a lot of different ways of doing it with electrified systems, even having the opportunity for software or algorithm development,” he said. Ford appears to be deliberating over whether to enter DPi in 2020 in preparation for the rules reset in 2022, or to continue with the Ford GT program until the end of 2021 before entering DPi in 2022. There’s also a third possibility: IMSA’s 2022 rules turn Ford off and it pulls out of the IMSA WeatherTech series entirely at the end of 2019. Right now, it seems a 2020 DPi entry is unlikely, with Rushbrook saying that IMSA would have to make a decision on the 2022 rules very soon in order for Ford to meet the development deadline for a DPi for 2020.